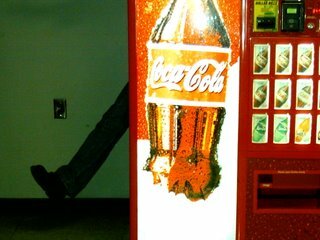 "I've always thought that Coke was dangerous. Not too surprising that you were eaten by this Satanic machine then." He got me thinking about EATING things. Namely, unusual things. And then I started thinking about the pictures that I unsuccessfully tried to post with the original all-county pics. Here are the strange eating pictures. 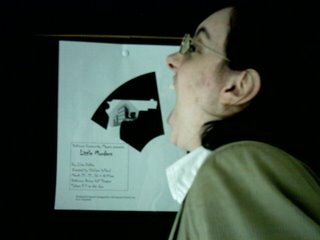 First, here I am trying to swallow the logo for a play that was being advertised. And then, of course, I tried to eat my one student's iPod nano. She was compulsive about my "guarding" it during rehearsals, and so of course I did. But every time there was a break, she'd ask me, "how's my iPod?" 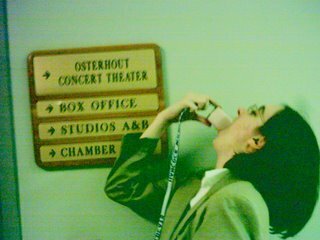 So, of course, I decided that I MUST do the eat-the-ipod trick and send her a copy of the picture. I titled it, "YUM, IPOD!" Thanks, Michel, for the inspiration. I've been sick lately (severe laryngitis, which makes teaching chorus a bit difficult!!! ), so it's been hard to think of something to write. It was good to talk to you for a few minutes last night - I missed hearing your voice. Hope you're starting to feel better, darling. I love you lots!